While the PC gaming world waits for Steam to kick off its annual summer games sale, Amazon gets an early jump with some deals of its own. 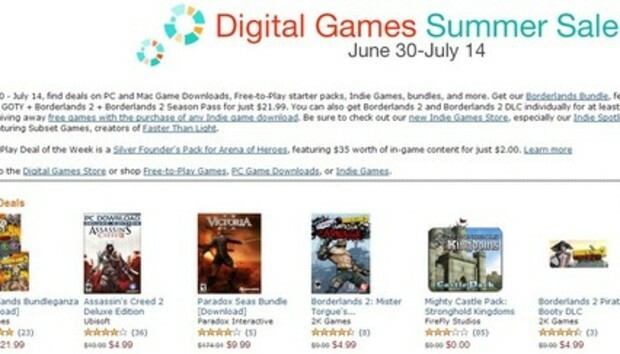 The online retailer launched its own summer sale Sunday on downloadable PC games. The sale runs until July 14. Unlike Steam, which typically rotates through various deals as its sale period progresses, Amazon lists all of its discounts up front, so you can peruse the store and purchase at your leisure. The headline deal on Amazon is the Borderlands "Bundleganza," which includes Borderlands Game of the Year Edition, Borderlands 2, and Borderlands 2 Season Pass--a $100 value--for $22. Amazon also shows some love for indie gaming with a set of $10 indie bundles (the Bit.Trip and CAG Bundle 3 being particularly noteworthy), and for free games with the purchase of select indie titles. It's a good time for gamers: On Monday, Green Man Gaming also launched what it's calling a 666 Sale: six deals every six hours for the next six days (or 144 deals total). Highlights in the first set of deals on Green Man Gaming include Borderlands 2 and its Season Pass for 80 percent off ($15) and Killing Floor with all its accompanying downloadable content at 75 percent off ($5). Because Amazon's deals aren't going away until July 14, Green Man Gaming's offerings will run into the weekend, and GOG.com is also having a sale, it might be wise to wait a bit and see what transpires with Steam before you blow all your gaming cash.